Unlike other weeks in the course, this last week we didn't have an in-class group exercise. Instead, we spent our class time learning about the composition, production, and post production process for creating product video prototypes. 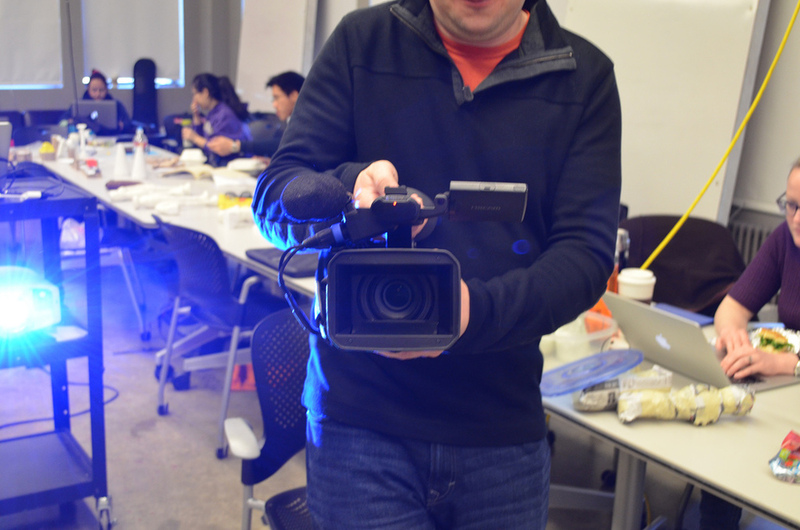 Then, during the week we worked on producing a one to two minute product video applying what we learned. I chose to create a video utilizing my paper prototype to comprehensively and concisely communicate the motivation, usage, and functionality of the GeoJournal app. Find the details of the assignment here. I set out to highlight some of use cases for the smartwatch app, when a phone might be inaccessible, inconvenient to use, or simply disrupt the experience of user. I began with storyboarding and writing a script that would create a story arch to show the circumstance, including the problem and user need, the actions that can be taken with the app, and finally, the result. With my rough sketches and script in hand, I went on to the filming process. Armed with a Canon Rebel Ti2, we shot at a total of four locations around Seattle (a friend's apartment, Gasworks Park, Milstead & Co. coffee shop, and The Troll) to get the shots outlined in my storyboard. I also created, using Adobe Illustrator, the watch and phone interfaces that would be inserted as overlays into the the video. Finally, I had to find the appropriate music and record the voice over that would set the mood and tell the story. Then, the editing began. This was my first time using Final Cut Pro. It was challenging to get all the pieces just right, while paying attention to the pace of the video. Overall, I'm happy with the result and proud that I was able to produce something within such a short turn around time. It's all about editing, editing, and more editing! It's best to choose and show a simple scenario to get your point across. Trying to do too much at once can confuse the viewer. Video engages many senses at once - sight, sound, motion, titles, and each of these modes should be used strategically to help inform the viewer. When presenting a value proposition, it's often more impactful to show the larger, overarching macro level emotional payoff than to focus on the specific features of a product. This is the difference between a successful commercial compared to a late night infomercial. Video prototyping allows you to tell a story about how you envision the future or ideal state of your product in use. It can be used to gauge interest in your product even before it is fully built. It allows you to demonstrate the emotional impact your product can have on a user's life. It can help you pitch your idea to various stakeholders. It is an artifact that can stand alone, without the need for further explanation. Production and editing can be extremely time consuming and expensive. Finding good actors can be challenging to find in a short period of time. It's all about showing verses telling. Video prototyping is a great tool for testing and sharing a product's value proposition. It's the ultimate tool for storytelling as it has the potential to provide an immersive and captivating experience and illicit an emotional response from viewers whether they are internal stakeholders or customers.